Former Pakistan skipper Shahid Afridi has wished India on its 70th Independence Day and called for peace, tolerance and love between the two nations as there was 'no way to change neighbours'. "Happy Independence Day India! No way to change neighbours, let's work towards peace, tolerance and love. Let humanity prevail.# HopeNotOut," tweeted Afridi. Every year, the Asian neighbours celebrate their Independence Days within a gap of 24 hours of each other. While Pakistan celebrated its Independence Day on Monday, India is all geared up to celebrate its Independence Day on Tuesday. Both the countries have witnessed several wars and conflicts in the past 70 years of their relationship. And in recent times, the relationship between the two nations has turned sour amid continuous ceasefire violations and terror attacks from the Pakistani side. 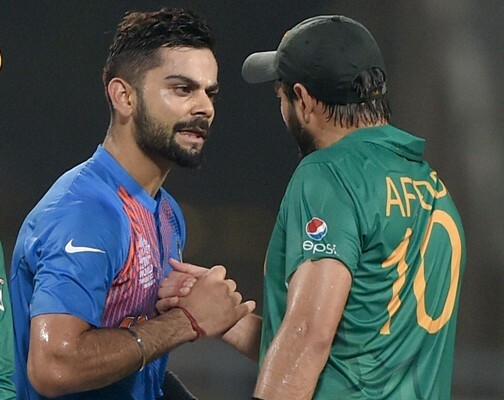 Image: Virat Kohli, left, with Shahid Afridi during the ICC World T20 match in Kolkata in March 2016. Is this the end of the road for Yuvraj? Tell us!